Pan what? Pan bagnat. Say it with a French accent and follow along. If you have never heard of a pan bagnat, it is essentially a French sandwich, loaded with all kinds of crazy goodness, and one that you will want to keep in your sandwich arsenal. The pan bagnat takes some time to prepare, but it is worth every big (or little) bite. 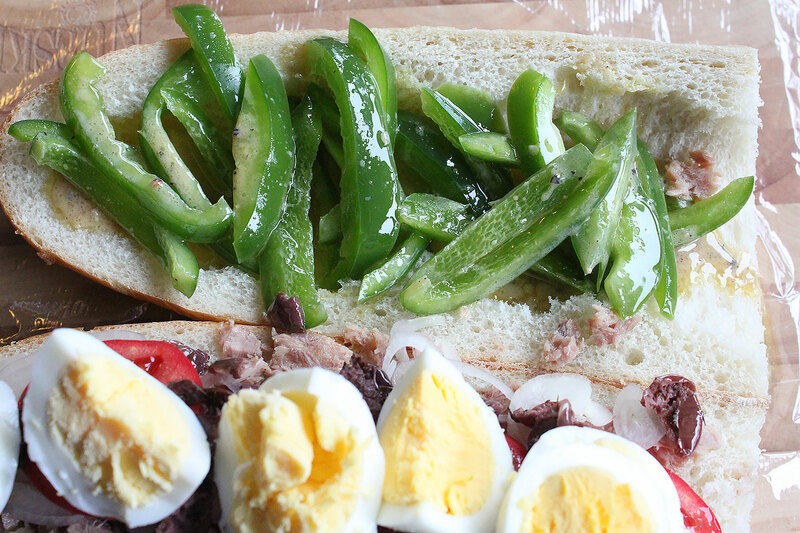 It is almost like a salad nicoise but in sandwich form, and trust me it is to die for. I am not sure if it takes more time to slice and dice and cook the eggs as it is to assemble this bad boy of a sandwich, but again it is worth every minute. Start by making your dressing. To a small bowl add the vinegar, mustard, olive oil, salt and pepper. Whisk or use a fork to create a nice thick dressing. Set aside and have everything ready to go. Time to assemble. I don’t think order is very necessary so do as you please. Start by laying down the tuna onto the bread. Crust to crust. Feel free to use the olive oil that it was packed in as well. Layer on the red onion, tomatoes, olives, eggs, and green bell peppers. Pour over the dressing, and fold. Get some plastic wrap out and tear off a long enough piece to completely seal in all of this goodness. If you want, go right in and go for it, otherwise plastic wrap it really tight, and let all of that settle and rest for about 30 minutes. When ready, remove the plastic wrap and dig in. This is one of those ‘guilty’ sandwiches that I had to make sure no one was around or looking because it is one I could not put down and one that I totally devoured. My wife and kids don’t like canned tuna (I have no idea why) so I knew I was all in, and trust me I was prepared. This could be one of my top 10 favorite sandwiches and one that I am sure you will love. Hope you enjoy! I am doing this tomorrow for lunch! I have been making soup, and soup, and more soup (cold weather here on the east coast), and it’s time for a good tuna sandwich. I will make this ahead of time to let the flavors soak a bit. Such a nice change from mayonnaise-based tuna salad — the wrap and soak with olives will make it like a muffaletta, yum!